Google Checkout offers AdWords advertisers free sales processing for up to 10X their monthly AdWords ad spend. In addition, merchants using Checkout get a nice graphic near their ad which helps increase the clickthrough rate of their ads, effectively lowering their click costs while driving more traffic to the merchant sites (in exchange for giving Google an excuse to market Checkout). 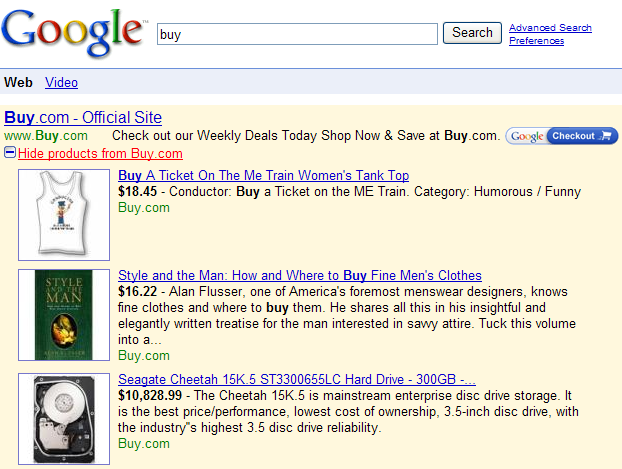 More recently Google has added coupons to some of these buttons, making them even more appealing to click on. I saw one competing site (in the retail vertical) using this coupon ad for their own brand. How silly is it for the advertiser to pay Google per click for AdWords ads targeted to their own brand AND give their customers a discount for going through Google rather than going direct? I have been seeing a lot more Google shopping results in the organic results, which also act as an advertisement for Google Checkout. Google has their own affiliate network through the Doubleclick Performics purchase. While Yahoo! is busy signing a deal to syndicate Google ads and Microsoft is playing catch up, Google is quietly setting themselves up as an inventory management system with more interactive ads…offering merchants convenient “free” extras each step of the way. How long until somebody buys Valueclick? When will one of the big 3 start offering publishers feeds that can be bolted onto newspapers and other large trusted sites? When will one of the big 3 offer a Chitika-like AdSense ad unit that charges advertisers on a per conversion basis rather than a per click basis? Google have been dabbling in the PPA space (Pay per Action) although I think they use a different three letters – think it might be PCA. Anyway its basically a payment per conversion type model. I missed the beta tests as I was otherwise occupied when they asked for volunteers. I’m very interested to see what they offer up. Nice article Giovanna and I think very well timed. As an advertiser, we are paying to promote Google’s Checkout brand and although we are getting tiny perks, like a higher click through rate, I feel we should get a discount on the clicks. Something to keep in mind is that a lot of these large online retailers are getting more than just free payment processing. Those $5 off deals are _very_ often paid for by Google, so there is no reason not to send all the customers you possibly can through them. 🙂 Increased sales, Google picks up the tab. Also, the big G has been known to give their customers quite a bit of money up front for “marketing” – meaning they start off with a big wad of cash, and use it towards promoting their brand & Google Checkout. What’s up with G holding this back and not rolling G checkout to the Australian market? Maybe that’s because Buy.com IS a thin affiliate site? Sure they have an affiliate program, but it’s basically incencitivized stuff – a 1-2% of their cut. You are right that we are promoting google’s product but we can also win trust by “Google” brand by placing Google Checkout logo in our adwords ads. I came across SWREG. They have new pricing for 0% (http://usd.swreg.org/zeropercentecommerce.htm). The features offered make it pretty interesting.